1)28:6,7, Saul ignored the silence of God, and sought out a witch. 2)28:12, The witch cried in fear because she realized the truth of what she was, and what exactly was happening. a) As a witch, she is lost. b)It was Saul that lied to her. 3)28:13, gods with a small g coming out of the earth. Rev. 12 tells who comes out or ascends from the earth. 4)28:14, Saul asked who it was, and she said; an old man with a mantle. Because of the interpretation of a witch, the ‘disobedient Saul’ saw a demon disguised as Samuel, and bowed to it! As disobedient people, whom do we bow to? Hi, Jack: Thanks for your note. We understand that not everyone agrees on how to interpret this incident. However, we do indeed believe that Samuel returned from the dead. The text does not indicate that the elohim was anything other than Samuel. We believe a more plausible explanation for the medium’s fearful reaction to the spirit was because it was not the familiar spirit she was accustomed to seeing. There is nothing in the text to suggest that she was remorseful about what she was doing, only concern that she not be caught and punished. 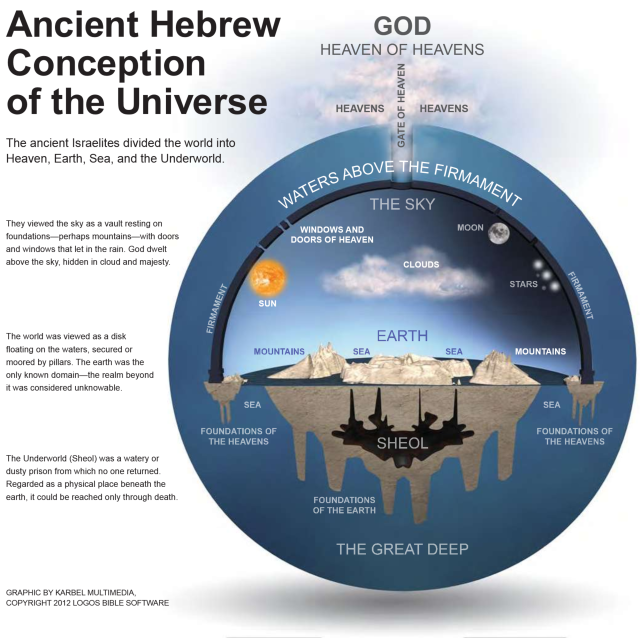 Hebrew cosmology in the Old Testament consistently identifies Sheol as the abode of the dead, good and bad alike, and locates it beneath the Earth. Samuel emerging from the Earth is completely understandable. See the illustration below. That’s enough for us to conclude that God allowed the spirit of Samuel to return specifically to deliver a message to Saul. It does not indicate that human spirits routinely hang around until they conclude unfinished business here on Earth. Thanks for the response. Just to let you know a little of what you are dealing with here. I was brought up Protestant, and eventually became Seventh Day Adventist (SDA). All religions do have a little truth, although the best lie is 99% truth. In order to understand where I have currently arrived to, you have to understand the state of the dead. Gen. 2:7 is what was made. Do a search on ‘sleep’ in your Bible, and you will see the state of mankind in death. I.E. Waiting on the resurrection. There is no life after death except in special circumstances like Lazarus, (he never spoke of anything happening after death) and the 24 elders who are arranged on thrones with Gods’ throne. It could be anyones guess who these 24 may be. I could make some guesses, but the only ones who were told directly were the 12 Apostles, by Jesus himself. Guesses would definitely include Enoch, Noah, Job, Abraham, Moses, David, (however, why not Jonathan instead?) Daniel was told specifically, ‘Go thy way until the resurrection.’ Dan. 12:13. Plainly stated, the witch of Endor and Saul sinned, and conjured up themselves a demon. Days later Saul died with his whole family, and David mourned Jonathan. Now I am no longer a member of any religion. I only believe The Holy Bible as written, and studied. If I am wrong about something, which is a given, I always want to know it, because I only want to know the God of The Bible. You are such a blessing to me. I needed this tonight. I’ve been at church all day. Going through some stuff, though. Thanks for the encouragement. Through you, God spoke to me tonight.